Sometimes when life’s busy and we get tired, by the end of the day it can be a struggle to cook a healthy, flavoursome, interesting dinner. My husband and I both work full time, our son’s at school, and with after school activities nearly every night of the week, and the odd social engagement, our days can get pretty hectic. As a food blogger at Goodfoodthyme, I also eat out a lot. I find it pleasurable to cook at home, for my family or hosting a dinner party, but day after day, cooking can seem like just another chore. I was excited to receive a Hello Fresh box. 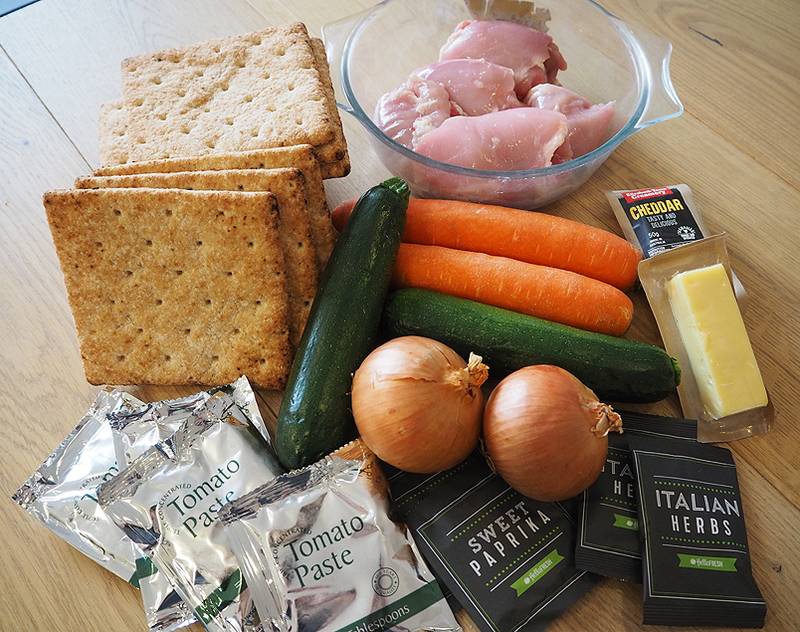 The box, delivered right to your door, contains pre-packed ingredients with recipes for five dinners. That’s dinner sorted for the working week! Unpacking the box and flicking through the recipe booklet, I was delighted to see the range of recipes. Each meal is packed separately in its own bag, with fridge items in a cooler bag. The packaging makes it easy to identify the meals and to store them in the household fridge. 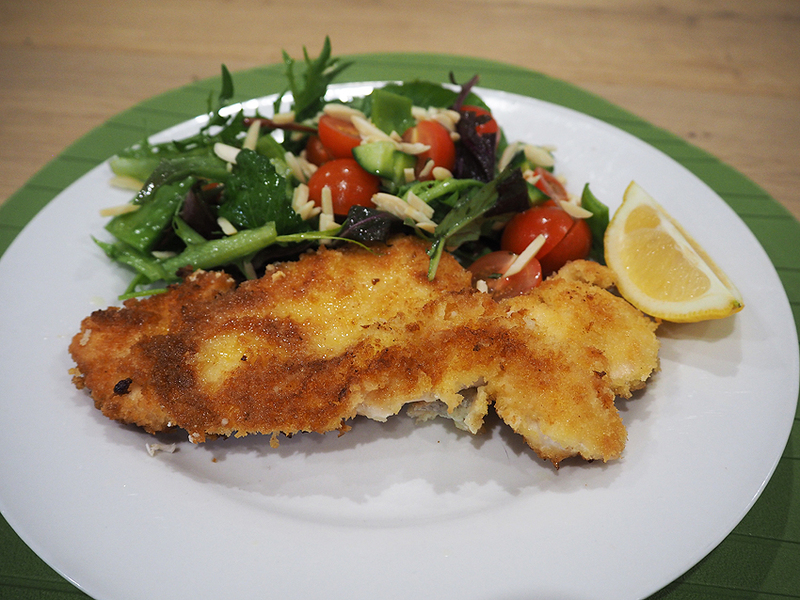 To get my 11-year-old son involved, I gave him the task of selecting the first dinner – he took great delight in choosing chicken schnitzel with lemon butter sauce and almond garden salad. A chicken schnitzel is often on the menu in this house; it’s a relatively simple dish to put together, and satisfying. Chicken breast was provided for the schnitzel and it was a great way to work out the day’s frustrations by pounding it with a rolling pin, to thin it out. Panko crumbs were provided, which I love to use. They give an extra crunch, especially if you double crumb. Pan fried, the schnitzels came out golden brown, crispy on the outside and moist on the inside, exactly how you want them to be. And the salad – for the most, fairly standard fare, lettuce, tomato, cucumber, but with snow peas – was completed with a rosemary and balsamic vinegar dressing. Without a doubt, this was a huge hit with my son. 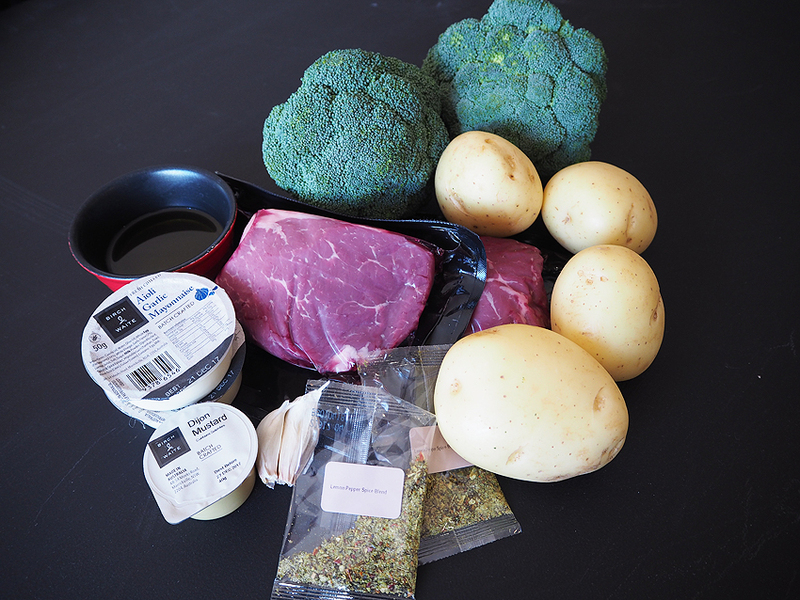 The next meal we tried was lemon pepper beef with warm mustard broccoli and potato discs. This came together so easily; the rump steaks were well cut, not too big, which suited us as we don’t tend to eat a lot of red meat. 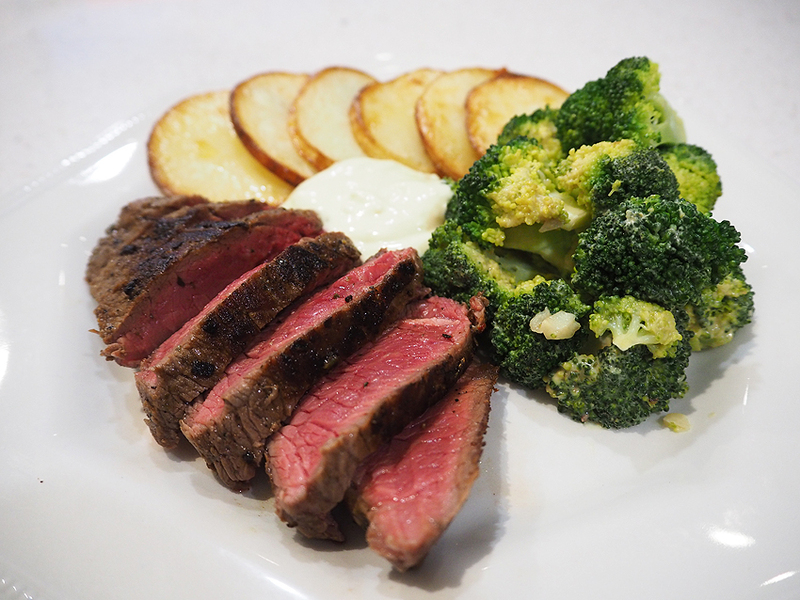 I loved the Dijon mustard stirred through the broccoli and the potato rounds were thin and light. The creamy garlic aioli topped it off. 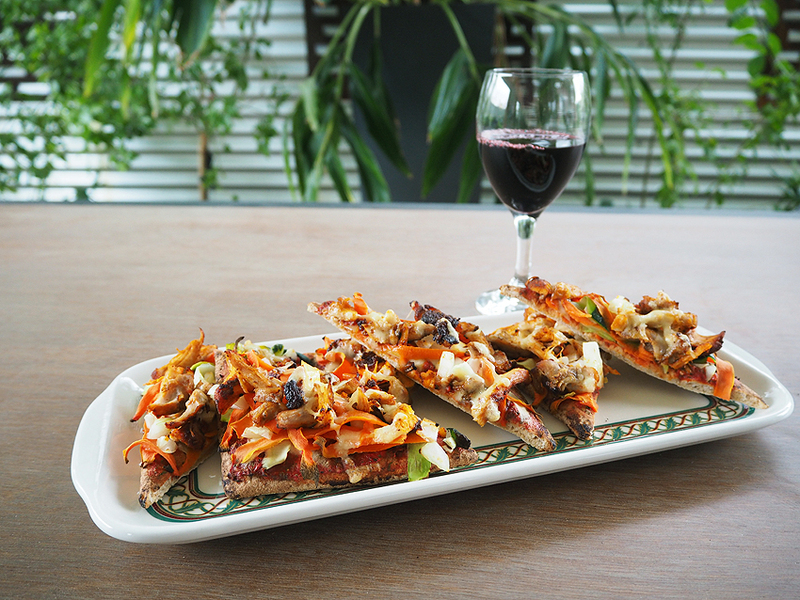 The paprika chicken flatbread is a fun dish! I loved the shredded chicken and the long strips of vegetables on top, with carrot and zucchini adding bright colours and texture to the dish. Cut into pizza-like slices, my son enjoyed it too, even with all the vegetables! And yes, I’m a little OCD – making sure the tomato paste base was spread right to the edges. I may have added a little extra grated cheese to the top. 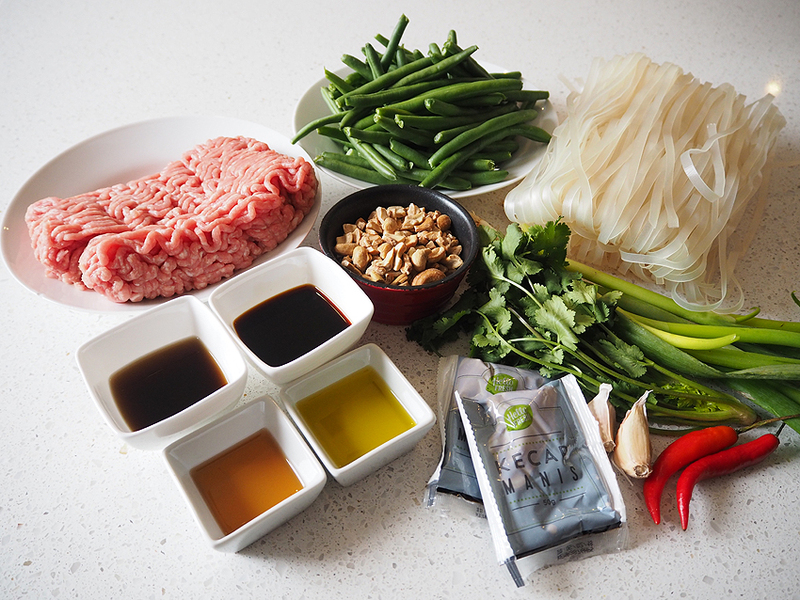 The sweet and sticky pork rice noodles with cashew vegetable toss was our favourite dish of the week. 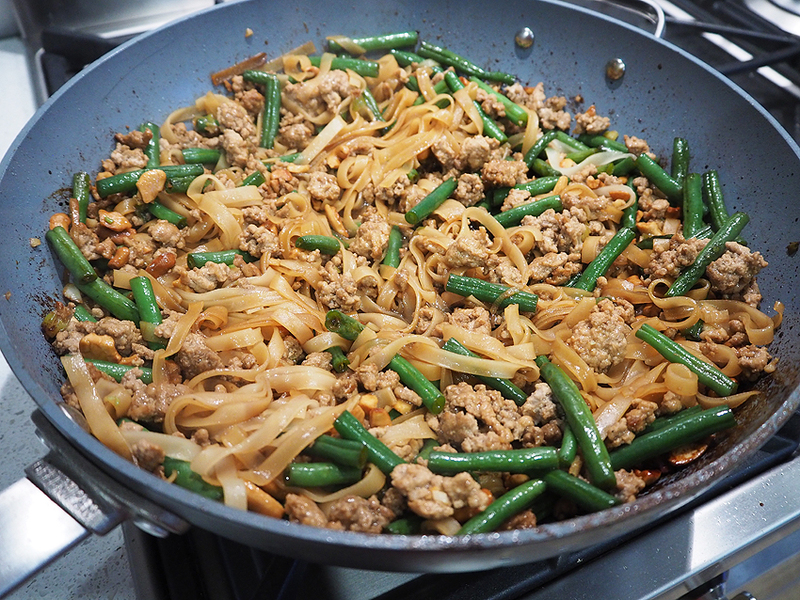 A flavoursome, healthy stir fry, with sweet kecap manis and crunchy cashews, with bright green crunchy beans. I think next time (and there will be a next time) I might throw in some bean sprouts. The oven-baked pesto and goat’s cheese risotto with zucchini and toasted walnuts was the most special dish of the whole selection. 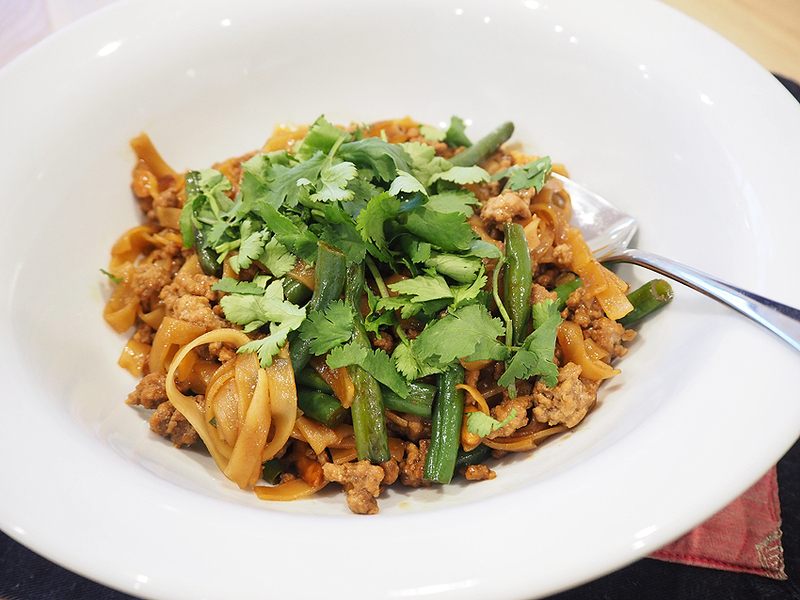 We shared this dish with close family, and it was a perfect way to showcase what the Hello Fresh box offered. It’s the first time I’ve made an oven-baked risotto. Usually I like to stand at the stove and agitate the saucepan. Plus, it was vegetarian, which we didn’t even notice. 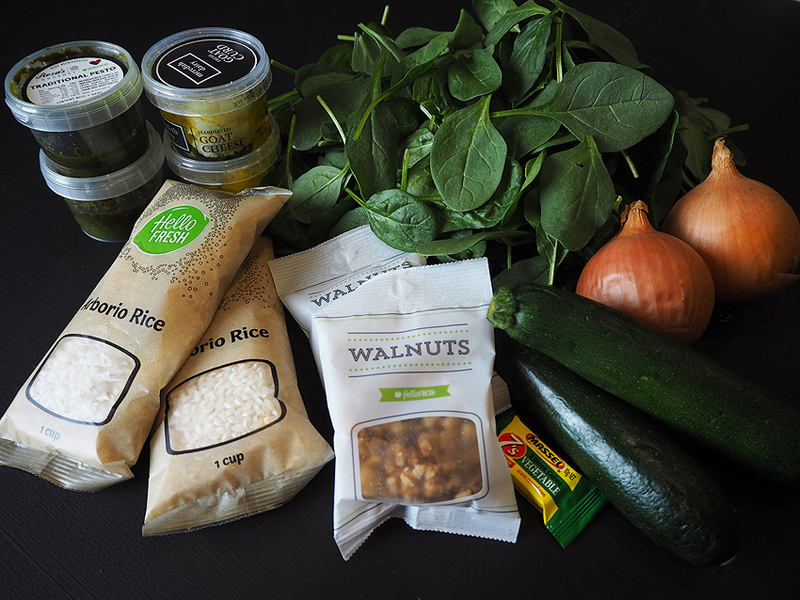 It was creamy and the rice was cooked perfectly with flavour from the onion, zucchini, baby spinach and basil pesto. 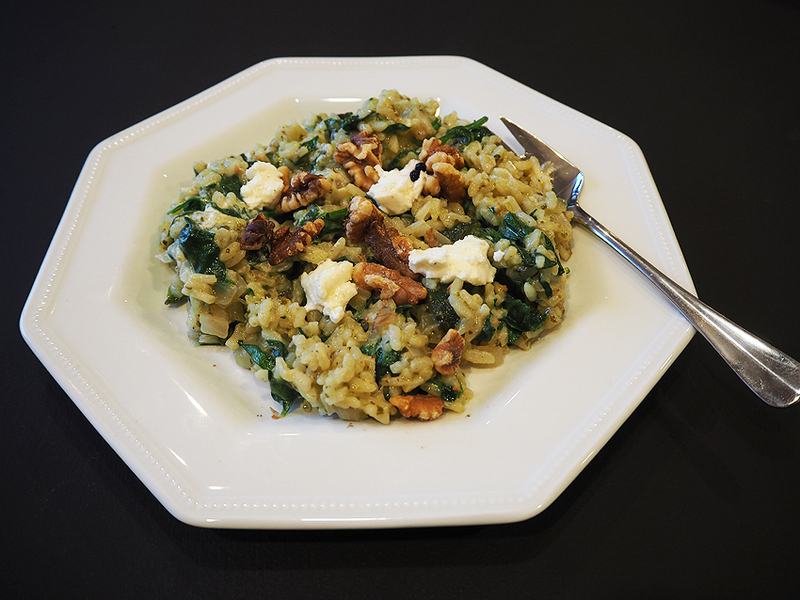 The toasted walnuts added a toasty crunch but the goats cheese topped it off – creamy and salty and oozing into the warm risotto. Our family loved it; so moreish. Personally, I found the recipes quite easy, so I wouldn’t mind seeing some more complex recipes from Hello Fresh in future. 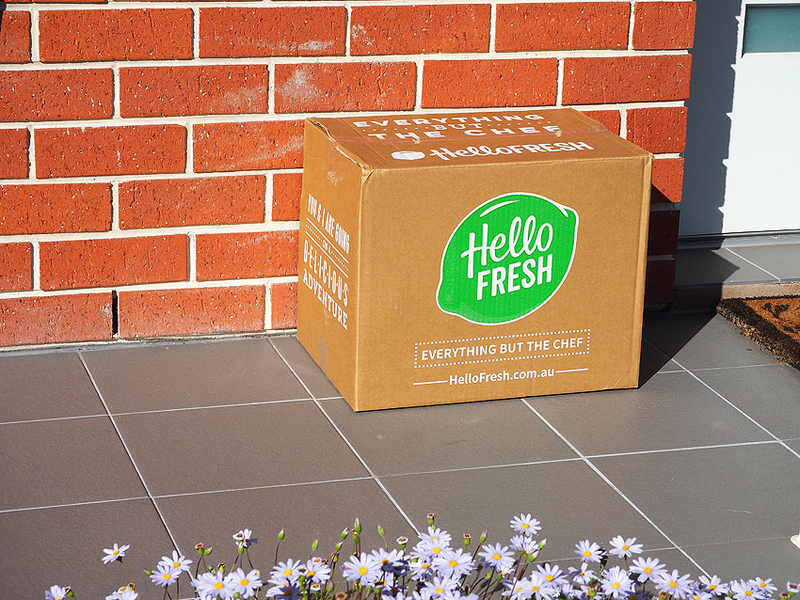 But what I love about the Hello Fresh concept is it gives you a variety of cooking ideas to suit most tastes and moods. Everything is measured out to exactly what’s needed. In Australia we throw out $8-10 billion of food every year. And as a nation we waste four million tonnes per annum of food, which ends up in landfill. It made me feel good – that I was doing the right thing for our family. 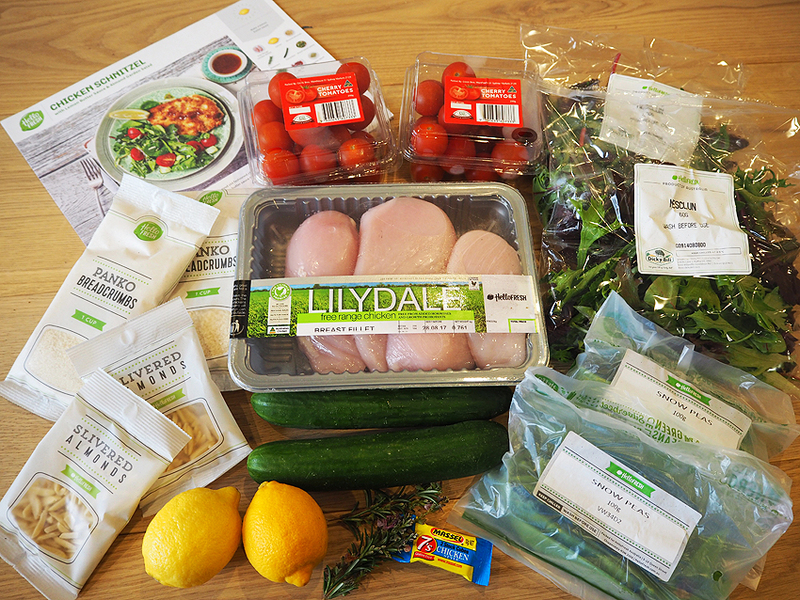 ** I was asked to try out Hello Fresh for Glam Adelaide and received a five day dinner box.